A longtime mining geologist and developer has come up with his own solution to Canada's long-running Arctic sovereignty dispute with Denmark. John Robins has filed and been granted a mineral exploration claim under Canadian law to Hans Island -- a remote pimple of rock between Ellesmere Island and Greenland that lies exactly on the international border. "It was done on a bit of a lark," said Robins, who's involved with a number of Vancouver-based mining companies. "The reason I applied for it is more just to stir the pot a bit." Back then, the two countries set out to draw a conclusive border between Ellesmere and Greenland -- at the time a Danish territory. They couldn't decide what to do about Hans and left it until later. Soon after, the Danish minister of Greenlandic affairs invaded. He left the Danish flag, a bottle of schnapps and a note that said: "Welcome to the Danish island." Diplomats are silent on the fate of the whisky. Canada's then-defence minister Bill Graham visited in 2005, followed shortly by some Danish soldiers. 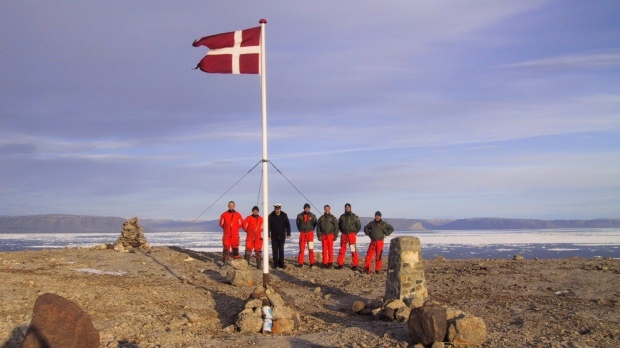 In 2010, 64 Danish tourists landed and erected a cairn with the Danish flag. It's not Robins's first attempt to beat back the Danes. In 2006, he filed a similar claim, which has since expired. Robins said there's a serious purpose behind his attempt to use an online mineral claim as a tool of conquest. "Canada's been very lax about pushing Arctic sovereignty," he said. He also wants to draw attention to what he calls the current government's neglect of the Arctic -- particularly the poor understanding of the vast region's geology, the foundation of the mining industry. Robins's permit was granted Feb. 4. The next day, Canada let Danish officials know. "The Canadians have reached out and we are in close contact with them," confirmed Henning Dobson of Denmark's Ministry of Foreign Affairs. Michael Byers, an international law professor at the University of British Columbia, said Robins's claim is a welcome nudge toward settling an old dispute with a friendly country. "He's successfully drawn attention to the fact we have an unresolved territorial issue." "The only thing that is stopping them is concern about domestic politics. No government wants to be accused by its political opponents of surrendering sovereignty."